‘In “Night Fishing at Antibes,” we’re looking at a night scene of two men fishing in a boat. And there’s a figure crouching with a spear, wearing a blue striped shirt, an article of clothing that’s often identified with Picasso himself. So, it’s a code for the artist’s persona. 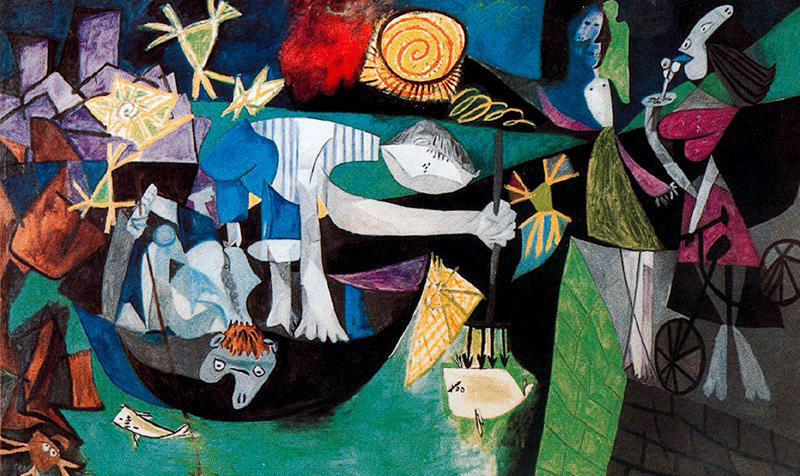 In addition to that, his companion, to the left, is looking, peering deep into the water over the side of the boat, and he has this hairy mane and patch of hair on top of his head that suggests the mythological character of the minotaur, with whom Picasso also relates in his career, a character that is out of Greek mythology, that recurs in his early work through the late ’30s. In the upper left corner of the painting are these purplish rocks, which also suggest architecture. And these wonderful twinkling stars in the sky that we follow around clockwise to the other side of the bay lead us to two women who are watching the men fish. One of them is the artist Dora Maar, Picasso’s then-companion. And one is eating an ice cream cone, a two-scoop ice cream cone, and holding her bike, while the other seems to be waving for their attention.